​The Springfield Alphas in partnership with the Martin Luther King Jr. Family Services Center are pleased to invite you and your organization to support our 2018 Thanksgiving awards. 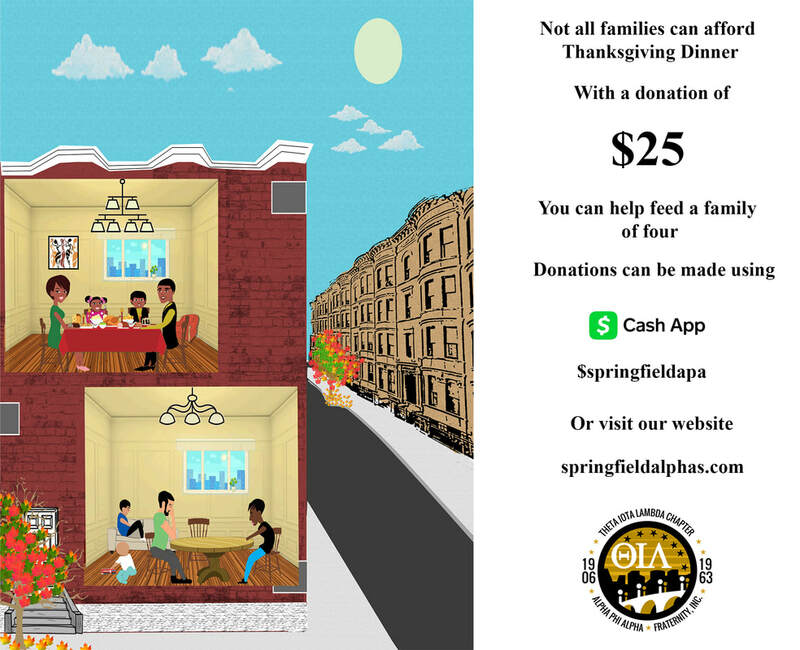 For the past thirty-four years, Theta Iota Lambda Chapter of Alpha Phi Alpha Fraternity, Inc. of Springfield, MA through its H. LaValle Smith Thanksgiving Dinner Awards Program has help make the Thanksgiving Holiday joyful, for hundreds of families in the greater Springfield Massachusetts. We have found that there are always more families in need of dinners than we can actually accommodate. We have not accomplished this alone. We once again invite you and your organization to join us in our efforts to help families this Holiday season. It costs approximately $35.00 per dinner basket to provide a family with a fully uncooked Thanksgiving meal. We are requesting your assistance in the purchasing of one or more dinners to help be “our brothers’ and sisters’ keepers”. We are also asking that your organization and/or representatives join us to help pack and deliver the dinners to the families on Sunday, November 18, 2017 at Martin Luther King, Jr. Community Center, 3 Rutland Street, Springfield, MA 01109. Please send donations to the address below. If you are mailing a check, we would ask you to use the link below to register your contribution as a check contribution. That will help us to know in advance and look for incoming mail. Springfield, MA 01101-4233If you are paying On-Line use the below to make your secure online contribution.